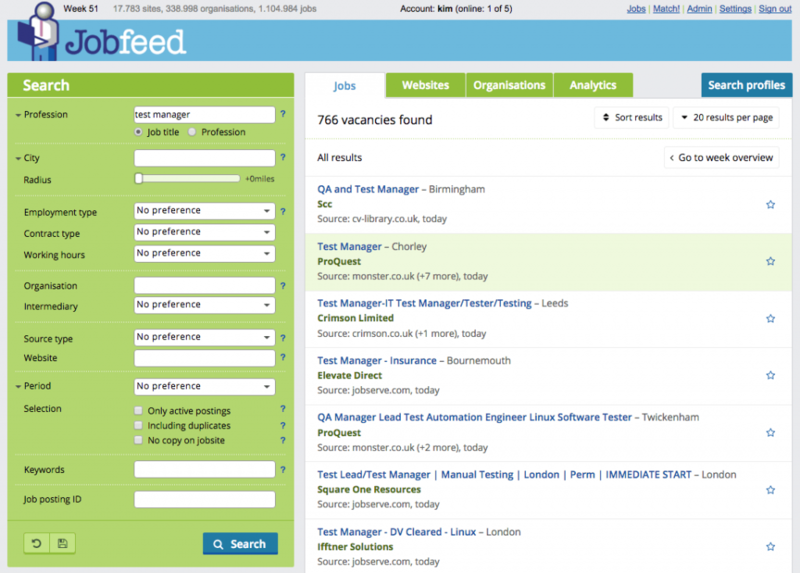 Textkernel has released a new version of Jobfeed that includes a revamped user interface. This new version further improves the user-friendliness of the portal and makes it easier to improve to implement future updates. Jobfeed is Textkernel‘s Big Data tool for jobs with which you can identify companies that are recruiting, follow the behaviour of your clients and prospects on the job markets, find jobs that match the profile of your candidates or get a detailed picture of the the supply side of the job market. To provide you a quicker and better understanding of your search results, we have adjusted the jobs list. You can now access from the get-go, the most important information for each of the job found and quickly select those that are the most relevant to you. Jobfeed classifies and normalises jobs to a set of professions. 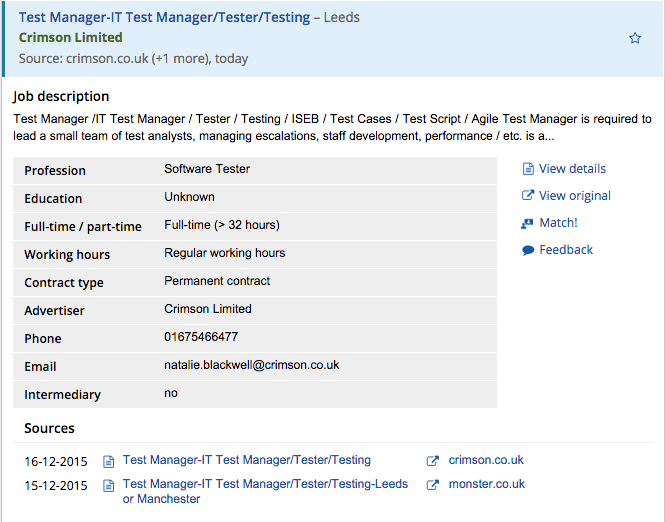 Jobfeed would normally show the normalised profession in the search results, instead of the job title. Following the feedback from users, telling us that the original job title often contained useful information, we decided to bring back the job title in the search results. You can now see the name of the advertiser without having to open each of the job vacancy. 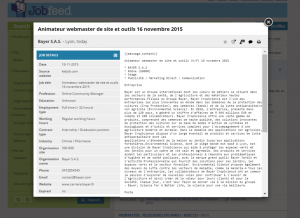 The new version of Jobfeed possesses new functionalities which will make the portal more user-friendly. By clicking on each job, a drop down windows with more details on the job selected such as job type, contract type, contact details of the announcer etc.. will be presented. You can also chose to display the job description or directly go to the website where the job has been posted. You can now use the up and down arrow to navigate though you search results and select those who are relevant to you. If you wish to visualise the text of the job description in its entirety, it will appear in a pop-up windows, allowing you to go back quicly to your search results. For more information contact us at info@textkernel.com. Try it out! Ask us for a free test account.